Watching Audrey Hepburn in Funny Face recently made me realise how much I adore a simple polo neck (or turtleneck). 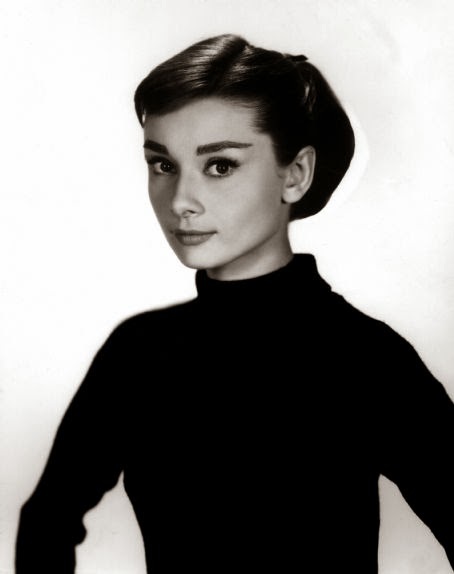 In the bohemian nightclub scene, Audrey is achingly cool in her beatnik uniform of black polo neck jumper and cigarette pants. A stereotypical outfit from that time but elegant nonetheless. Polo necks are everywhere this autumn/winter. Even crop tops and bodycon dresses are sporting the classic high neck. I put a modern spin on the beatnik look by taking a teal polo neck jumper and pairing it with navy and green check trousers with gold detailing. To me, this outfit conjures up images of autumnal walks (without the pointed courts of course!) and evenings by the fire discussing poetry and literature in true beatnik fashion. The mix of cosy knits and check also encapsulates the heritage trend. A polo neck jumper would also look wonderful either tucked into this season’s key piece, the full skirt, or into a ladylike pencil skirt. The Retro Suitcase Is On Facebook!